When they got back from the beach, Lisa’s watch had been stolen. ‘It was here on the bed,’ she told the hotel manager. Mr Fersen glanced around the room, at the sliding door open on to the balcony. The white voile swayed gently in the breeze that came off the ocean, and there was a distant roar of surf, and the woody rattle of palms. Adamu, silent, studied him. Mr Fersen was a red-faced Scandinavian who perhaps lived in his own little ex-pat compound, in his air-conditioned house, surrounded by generators and satellite dishes. A man who’d been a misfit back home. Adamu lifted his hands in a gesture of dismissal, thanking him, aware that Fersen’s eyes skated over him, as if black men were not supposed to be hotel guests. Especially a black man with a blonde girlfriend. The door closed behind Fersen. ‘We should have gone to Italy again,’ said Adamu. ‘Oh, don’t worry,’ Lisa said, ‘once I get the police report, I can claim it on the travel insurance. Inspector Njie glanced around their bedroom from between fat eyelids, and scrawled a few words on a small memo pad. ‘I’ll need a police report for the insurance company,’ said Lisa. Njie’s eyes retreated even further under his eyelids as he smiled. His skin was pocked, and a crescent of sweat seeped out of each armpit across his faded uniform. ‘When you flying back to England?’ he asked, still with the smile. ‘British,’ repeated Njie with a snort. Adamu wished he hadn’t volunteered to fetch the report, but Lisa had seemed reluctant, perhaps a little scared. At least, he thought, if I dress plainly, I’ll look like one of the locals. A bus service went into town past the hotel, and he decided to try it rather than bother with a taxi. It would help him to blend in. Even though he was black, his skin was pale from London, and he was too proud and neat, even in a plain t-shirt, shorts, trainers. Leaving the hotel compound, he got past the souvenir stalls, but a group of children saw him, and shoaled like piranhas, showing white teeth. You were supposed to take sweets to give them; he had none. He fended them off and then, made guilty by their hunger and dirtiness, handed out a few coins. The press of children around him gathered mass, and he only just made it to the minibus. The driver grabbed the banknote Adamu offered, and yelled something incomprehensible, and the little Toyota lurched off along the bumpy road. 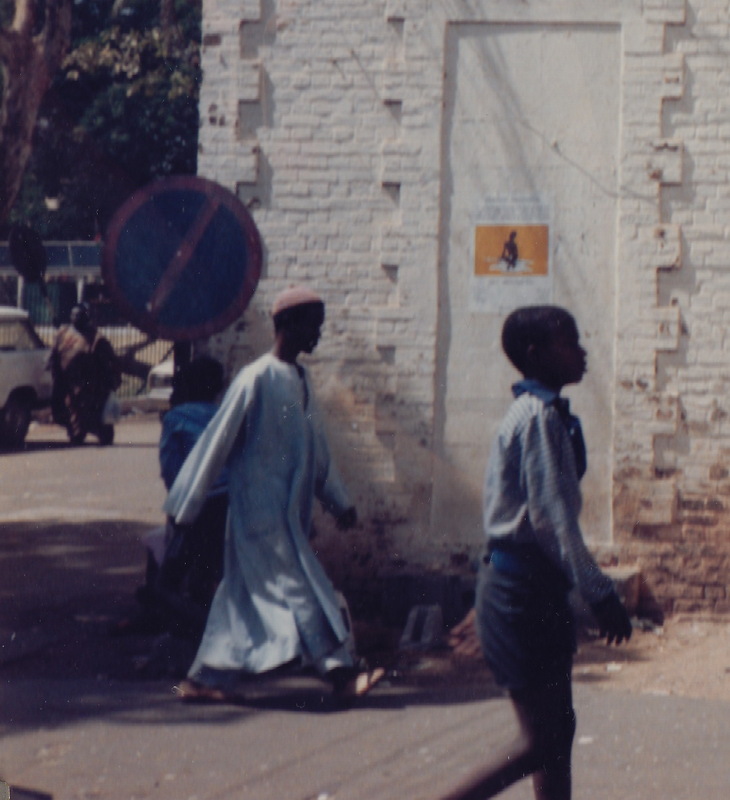 Adamu had no real idea where he was going; Mr Fersen had drawn him a map, but he could see no street signs. The hotel was at the end of a long palm-lined avenue that ran behind the white beachside villas of Government officials and embassies. As they went towards the town, they started to pick up more passengers. Young men clung to the outside of the minibus, while plump ladies swathed in cloth squeezed into the seats. The houses became smaller, built of breeze block and corrugated iron, rubbish started to blow about in the red dirt of the streets, sewer trenches ran along the roadsides. Men sat outside their houses, repairing a bicycle, smoking a cigarette, or just sitting. The woman opposite him had a fat toddler bound to her in a shawl. She leant grinning over her sleeping child, and said something he could not understand. Adamu attempted to say it. At least, the women pointed out the police station, and shouting at the driver to stop the minibus, shooed Adamu out on to the pavement. He had no idea how he would get back to the hotel. The police station was a crumbling building, with furniture dating from before Independence, and a smell of disinfectant. Inspector Njie wasn’t available. Adamu waited in the reception area, feeling irritable, and then he waited in the waiting room. Other people came in, and sat, and were called in. People who had presumably been arrested were escorted along. The hours crawled past. He tried not to be impatient. He saw that people who had come in after him had been seen and dealt with, and were leaving the station. Then, past lunchtime, he was taken to a bentwood chair in the corridor outside the inspector’s office, and he waited there. It took forever. He got to the point in his imagination where he was so angry with Njie for his corruption and incompetence, that he balled up the police report and shoved it down the man’s throat. Eventually, Inspector Njie opened the door. There were no other chairs. ‘Ah, the watch.’ Njie leant back in his wooden captain’s chair. ‘The watch.’ He stretched his belly upward to pull a notepad out of his trouser pocket, and then leant his elbows on the chair arms and shuffled himself upright again. He turned one by one through the pages. He smiled, reading, a page of the notepad paused in mid-turn, his eyes buried in their fat lids. ‘You said the report would be ready,’ said Adamu, knowing that it wasn’t. ‘We can post it to you.’ Njie smiled again. Adamu shook his head. He didn’t believe anything Njie said. He could sense Njie was playing with him, dragging it out, holding out for a bribe. It was infuriating; the man was fat, corrupt, lazy. But Adamu swallowed his bitter words and took a deep breath. Njie shrugged, spreading his hands, one holding the notebook, the other hand open like a fat starfish. ‘So, when am I going to get the report?’ Adamu glared at the inspector. ‘Very expensive,’ purred Njie, in a sympathetic tone. He sighed and closed his notebook and rested it on his paunch, under folded hands. He looked up at Adamu, with his lips pressed together, and his mouth in a downward curve. ‘For heaven’s sake, man!’ Adamu suppressed his voice, fighting the irritation that was bursting up inside him again. ‘Come back tomorrow,’ said Inspector Njie. ‘We will do our best to prepare it in time for you.’ He levered himself up on his chair arms and stood, holding out a handshake. Adamu wheeled about with clenched teeth and slammed out of the office. A boy dashed up and held out a hand for money. Adamu ignored him and kept walking in the vague direction of the hotel. After about twenty minutes, a taxi approached from the opposite direction, and he hailed it without much hope. His heart sank as it went past, but then he heard it wheel about and come up behind him. He asked the driver for the Palm Sands Hotel. It took an incredibly long time to reach the hotel, and Adamu had seen most of the city centre, by the time the driver set him down and politely requested an extortionate fare. It was nearly five o’clock. Mr Fersen raised an eyebrow at the reception desk, as Adamu strode through the hotel lobby. ‘Good afternoon, sir,’ he said, with a knowing smile. Adamu ignored him. ‘I was so worried about you,’ said Lisa, embracing him. Adamu was furious, to the point where his throat ached and his eyes stung. They argued then. It was the first time for ages. Lisa wanted to offer Njie the bribe. The next morning Adamu reclined determinedly on a lounger, staring at the ocean thundering into white foam sheets that faded on the sand. He batted away annoying flies, and the sellers of soft drinks who seemed to have slipped past the hotel security and found their way on to the private beach. He kept near the waterline, as far as possible from the Italians doing their aerobics class. The breeze tried to flatten a week-old copy of the Financial Times against his face every time he opened it out. Tiny bits of woody material drifted down from the rattling palms. He tried not to worry about Lisa. She had had a tougher life than him, it was true. And suddenly, he was admiring her, as she ran triumphantly across the sand, and plonked herself down beside him, with her beachbag on her lap. She leaned over and gave him a gloating kiss. She had bought a shell bracelet from the souvenir sellers outside, and the little beads were glowingly white against her tanned arm. ‘Look at this,’ she said, grinning. She pulled a sheet of paper out of the bag. Adamu took the thin piece of paper. It was a blank form, proudly crested and headed ‘Police Report’. Spaces underneath were for details such as ‘Location of Crime’, ‘Date of Crime’, ‘Nature of Crime’ and ‘Weather Conditions’. ‘You stole a form? You stole from the police?’ Adamu was shocked.